Retrofit your existing fort or swing set with a swashbuckling rope ladder kit. Helps your little athletes develop upper body and leg strength. 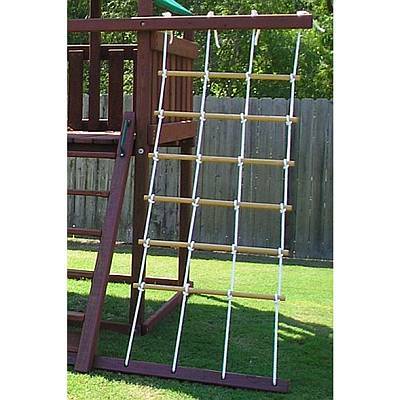 This rope ladder has been constructed with 1/2 inch weather-resistant nylon rope and durable 1 1/4 inch wooden dowels. Each ladder measures 3 feet by 9 feet.. This swingset accessory makes an excellent addition to your Wooden Swing Set or Fort Kit. Each of our swingset accessory pieces can be purchased as separate activity items or as complements to our basic wooden swingsets and forts. Choose any number of our action paced components to help your kids develop strength and coordination, and at the same time, encouraging social interaction and cooperation. All of our accessories are constructed of the same durable, high quality materials as our swingsets and fort kits. Our swingset accessories offer fun and excitement while they also help stretch tight budgets. All of the materials used in these accessory pieces have been selected for their strength and ability to withstand exposure to the weather outdoors and the heavy use they will experience when your kids discover them. Your kids will be delighted with this Rope Ladder added to their swingset or wooden fort swingset. Let their imaginations soar when they make up games using this terrific swingset accessory. Your kids will love it and this ladder will last for years to come.